This is my absolute bargin blazer. I got it in a charity shop earlier last month for £5! It's really structured at the shoulders and it's really good length for me. I love it! Those boots are my most recent buy from ASOS. I was umming about them for ages, but i'm so glad i got them! They're so lovely. It's been an average Saturday, done the washing and a little food shop. Then went to pick Matts new glasses up. They actually look really nice on him. I think it took a while for him to get used to them but im sure he'll find it difficult taking them off! If any of you follow me on Twitter you'll know i mentioned last week about Matts sleeping. He used to have a condition where he'd appear to be awake to you or i but actually still be asleep, so he would get up walk around, have conversations but wouldn't remember a thing for hours. Luckily, it's all sorted but he still sleep talks and last night was crazy! None of what he said made any sense at all, because each time i was actually asleep. He doesn't call me Vicki that much anymore, so that was strange too! So, at 5am i'd had enough and went to sleep in my room. He comes bouncing in this morning, happy as anything totally unaware of ANYTHING that he said/shouted. It was hilarious talking about it. Im sure they was so much more, but that's just what i would remember in my sleepy state. Uni work has been a fail today, i ended up falling asleep. Tomorrow will be better! Can't do any tonight, it's xfactor day! Im 13 away from 500! Which means giveaway time! Love this! And gosh, your hair colour is to die for. It's just so rich and chocolatey. ..perfect outfit ..looove the blazer and boots ..gorgeous .. Cool blazer, I swear the charity shops where I live are so rubbish! I never find anything in them! I looooooove this. You look gorgeous as always! I laughed at the sleep talking - I do that but only if I get woken up a little bit. The most oddest thing I have ever said (which is actually quite embarrassing) was when I fell asleep on the sofa and J tried to wake me up to go to bed..and I started whimpering saying "Please dad, let me watch a bit more TV. Pleeeeease daddy." HAHA. I love your owl necklace! That's crazy about your BF, I bet it was a little funny too though! Hahaha - poor you being woken up to listen to that but it is really funny! Love the owl necklace too and the boots are gorgeous! Lovely outfit, I love the blazer too. My boyf talks in his sleep too! sometimes it's just mumbling but sometimes it's like he's having an actual conversation with me. Of course he remembers nothing though! That blazer looks great! 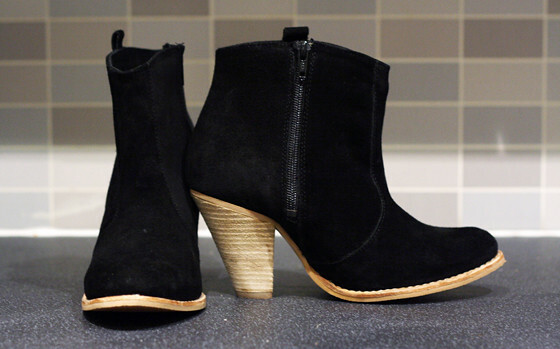 I've been eyeing off those shoes as well, and maybe now I'll have to bite the bullet and buy them seeing as you've given them the thumbs up. Those boots are awesome! You look great lady! I've just started following you on Twitter. I don't know how I'd deal with my boyfriend having a condition like Matt's, I commend you lol. That blazer is stunning! Finding it was a lucky strike!!! You also look great with your hair in a high bun!! Have a lovely Sunday sweetie!!! Those boots are awesome - perfect. Love the red in the outfit. Spices it up! 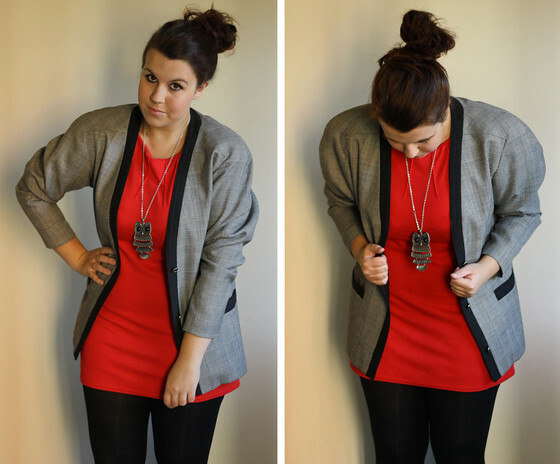 Love that blazer!It looks great combined with red top! Lovely blazer, I need to hit the charity shops asap. My best find was a camel silk shirt for £4. Youre blog is so sweet :) Love the design! i love your blazer and owl necklace! so great. Love the colours of your outfit and those boots are so yummy i bet they will go wth everything. Very lovely! I've got the same necklace!